Music ensembles from the College of Southern Nevada Department of Fine Arts will present a fundraising concert Tuesday, Oct. 8 to benefit the Joe Williams Music Scholarship. The Joe Williams Music Scholarship has assisted music students at the college since 1989. The event will be held at 7:30 p.m. in the Nicholas J. Horn Theatre on the Cheyenne campus. General admission is $8 for adults, $5 for students and seniors. The CSN choral program, under the direction of Dr. Mark Wherry, will feature its Chamber Chorale and Jazz Singers. The Concert Band, conducted by Dr. Richard McGee, will perform traditional works, and the Wednesday Night Jazz Band will round out the entertainment with a tribute to legendary jazz vocalist, Joe Williams, the namesake and creator of the scholarship. Other CSN music groups are also scheduled to perform. Carlos Holguin, a music major with an emphasis in Jazz, is one of many students who have benefited from the scholarship. “This has been an incredible opportunity for me and has opened many doors,” says Holguin. 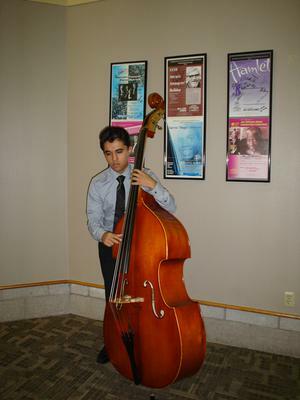 “Thanks to the encouragement of the music faculty, I now play bass with the CSN Orchestra, the Jazz Singers and the Advanced Jazz Combo, and I will be taking voice lessons in the fall.” Along with the goal of being a jazz musician, Holguin plans to minor in education so that he can share his knowledge and be a mentor to aspiring music students. The CSN Performing Arts Center is located at 3200 E. Cheyenne Ave. For reservations and more information, call the CSN Ticket Office at 651-LIVE (5483) or visit CSN tickets.